Gangtok Lachung Pelling Tour Package | Call @ +91-993.702.7574 For Booking. Getting away from the city’s hustle bustle is the best way to take some time off and relax. Travelling to a hill station is the best for your aura.The Gangtok Lachung Pelling Tour Package will let you explore the unmatched beauty of beautiful mountains and landscapes. The picturesque and serene surroundings with the quaint monasteries traditionally built village houses and the innocent residents will let you believe that you have arrived in some kind of paradise. Adventure, nature, spiritualism, cultural and most importantly peace of mind, Sikkim is one of those places that some might call too good to be true. However, the fact remains, there exists a place as unbelievable as Sikkim that makes all the wishes of an avid traveller come true. 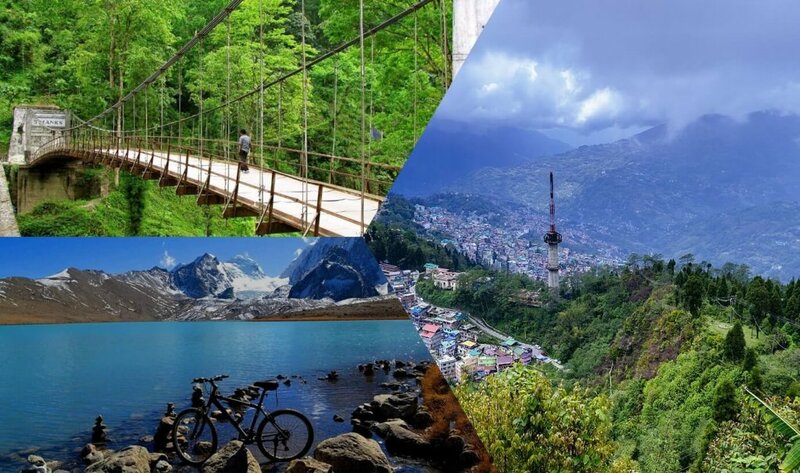 The Gangtok Lachung Pelling Tour Package will cover all the picturesque areas and guarantees to take you on a journey of a fairytale land where landscape and terrains and ambience are such that you may not want to return. In our itinerary will be included local sightseeing tour in and around Gangtok. We will also head to Lachung, which boasts about its flourished Valley of Flowers, Yumthang Valley. The beauty of this place is such that it can melt hearts. Situated 3598m above the sea level, this makes for a place where you may want to bask for hours. Far from the madding crowd, this place sits in the lap of nature and calls you to do the same. Soak-in the divinity and lovely scenery sprinkled all around. The Gangtok Lachung Pelling Tour Package will take you to a land of wonder this holiday season. This 8 days itinerary will ensure that you have a gala of time and enjoy the trip to the fullest. The soaring snow-capped peaks and herds of wandering yaks make this a Himalayan paradise. Choose our Gangtok Lachung Pelling Tour Package to enjoy this once in a lifetime journey of your life. On arrival at NJP Railway Station / (IXB) Bagdogra Airport, (500Ft / 150Mtrs) will be received by our office Executive who will assist you to board your vehicle to Gangtok (5500 Ft /1677 Mtrs, 130 Kms / 04 to 05 Hrs). Check-in and overnight at Hotel. After breakfast, in the morning, start for excursion to Tshangu Lake (12400Ft / 3780 Mts / 43Kms in 3Hrs one way from Gangtok) and Baba Mandir (13100Ft / 3994 Mtrs / 16Kms in 1Hrs one way from Tshangu Lake) (no entry for foreigner national, they are allowed to visit till Tshangu Lake, with a valid permit. They also have to be 02 and above is number to visit Tshangu Lake). Situated at a height of 12400Ft / 3780 Mtrs / 43Kms in 3Hrs one way, with an average depth of 50 ft. The cool water of the Lake is perfectly attuned with the scenic beauty around. Back to Gangtok and Overnight at Hotel. (In case of Landslide or due to any other reasons if Tshangu Lake is closed then an alternate sightseeing will be provided) Optional Nathula(14140 Ft / 4310 Mtrs / 20 Kms in 1Hrs one way from Tshangu Lake) Baba Mandir (13100Ft / 3994 Mtrs / 16Kms in 1Hrs one way from Tshangu Lake) is an Indo China border, controlled by the Indian Army and is situated approx 20 Kms ahead of Tshangu Lake at an height of 14140 Ft / 4310. The journey to Nathula and Baba Mandir is same up to 16 Kms. At this point, the right arm of the “V” which is 4 Kms takes one to Baba Mandir and left arm of the “V” which is 4 Kms takes one to Nathula. One can opt for Nathula Excursion by paying a supplement cost which varies from month to month. Nathula permit gets confirmed 24 hrs prior to the journey date and it is subjected to permit availability as it is allotted as per lottery. Nathula is closed on Monday and Tuesday for tourist. Organising the permit at the last moment is not possible and a clear window of 72 Hrs with proper documents is required to process the permit. To process the permit we would require 04 Passport Size Photograph and photo proof identity card such as Voter Id / Passport / Driving License. Pan card and Aadhaar card is not accepted as identity proof by authorities. There is no refund, in case the permit is confirmed by Sikkim tourism and due to whatsoever reason (Landslide, Heavy rainfall, VIP Movement, Health issue etc) one is not able to visit. Pick from Gangtok Hotel and transfer to Lachung (8000 Ft / 2439 Mtrs / 124 Kms / 05 ½ to 06 ½ Hrs). On the way visit Tashi view point, Seven sister’s waterfall (Subjected the vehicle take the normal route). Overnight at Hotel. Early morning proceeds on a half day excursion to Yumthang Valley (11800 Ft / 3598 Mtrs / 25 Kms / 1 ½ hours one way). Visit Yumthang Valley is a day excursion from Lachung, which is an attraction for tourist visiting this region. The colourful Singba Rhododendron Sanctuary bloom between April to June. The soaring snow-capped peaks and herds of wandering yaks make this a Himalayan paradise. The valley is also known for its Hot spring. Although the water is quite dirty, many locals from the area visit to get themselves soaked and cured as believed. Overnight at Hotel. Optional Yumesamdong known as (Zero point)(15300 Ft / 4665 Mtrs / 24 Kms / 1.5 to 2 Hrs from Yumthang one way) (no entry for foreigner national. They also have to be 02 and above is number to visit North Sikkim Lachen and Lachung. Foreigner nationals are allowed to visit till Yumthang, with valid permit). Yumesamdong excursion can be availed by paying a supplement cost of INR 3000.00 per vehicle. Yumesamdong located beyond Yumthang. The journey from Yumthang trudges up through the rugged mountain road. The aroma of the sweet fragrance of Ezilia permeates the air. Ezilia is a plant used by the inhabitant to manufacture incense sticks. To process the permit we would require 04 Passport Size Photograph and photo proof identity card such as Voter Id / Passport / Driving License. Pan card and Aadhaar card is not accepted as identity proof by authorities. There is no refund, in case the permit is confirmed by Sikkim tourism and due to whatsoever reason (Landslide, Heavy rainfall, VIP Movement, Health issue etc) one is not able to visit. Transfer to Gangtok. On the way, see the Bhim Nala waterfall. Overnight at Hotel. Morning Go for a half day (04 hrs) sightseeing covering Jhakri Water Falls along with Droul Chorthen, Research Institute of Tibetology (Closed on Sunday), Directorate of Handicraft and Handloom (Closed on Sunday) and Flower Show. Afternoon transfer to Pelling (6100 Ft / 1860 Mtrs, 116 Kms / 05 to 06 Hrs). Overnight at Hotel. After breakfast we drive to Yuksom (5840 Ft / 1780 Mtrs, 35 Kms / 02 Hrs) on way panoramic sightseeing of Darap Village, Rimbi Waterfall and Hydro Project, Khecheopalri Lake (6000 Ft / 1829 Mtrs), it is one of the sacred Buddhist mountain lakes and it is believed that whatever is wished in front of the lake comes true. A myth is that when a leaf falls on the placid clear water surface, it is picked by a bird and Kanchanjunga Waterfall. A further drive takes you to Yuksom (the meeting place of three monks) – the first capital of Sikkim. This was the place where the first Chogyal (a ruling dynasty in Sikkim) was crowned. Evening Back to Pelling and Overnight at Hotel. Transfer to NJP Railway Station / (IXB) Bagdogra Airport, (150 Kms / 05 to 06 Hrs) for onward connection.